This analysis is a synoptic graphic approach to identify the most important of the multitude of features that make up the landscape area in question. 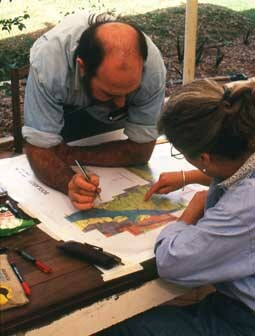 Maps of geology, topography, drainage, soils and vegetation at the same scale are used as base maps for the map overlay analysis method of Prof.Ian McHarg (Design with Nature,1969). Landsystem maps are composites of these landscape features and are used as the base map in the EMU process. These are enlarged to a scale of 1:100.000 (1cm=1km) and depict in colour-code the composite terrain patterns of landform, catena, geology, soils and vegetation. Landsystem maps are used interchangeably with a satellite/Google Earth image of the area at the same scale. The satellite image helps familiarize participants observation skills for the aerial view exercise that follows. 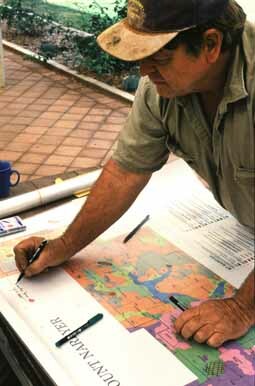 The baseline overlay mapping exercise involves the land manager and partner to draw by hand their local knowledge of the land onto transparent overlays in answer to some fifteen questions. The diagnostic sequence is comprised of six exercises: (1) Participant's baseline mapping exercise, (2) Station air traverse, (3) Ground traverses of key areas, (4) Map recording of findings, (5) Fixed-point photo record, and (6) Truthing Follow-ups.